Chia seeds are a little nutrition-power house packed with fiber, protein, healthy fats, calcium, and more. 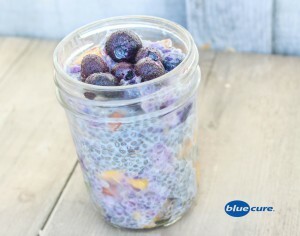 Use them in your morning oatmeal, toss them into a smoothie, or make them the starring role in a chia pudding. This recipe is incredibly easy to make, and is a satisfying snack or breakfast on-the-go. Fresh basil is optional in this recipe, but we think it adds a nice, refreshing flavor— and it for sure adds a nutritional punch! Wash the fruit and basil. Dice the nectarine and chop the basil. Add the fruit and basil to the chia seeds and stir. Cover the container and store in the refrigerator for ~1 hour or overnight. Split into two bowls or cups and top with additional berries. Enjoy!